Cleaning up the America off of Kewanee, WI. We brought up two down riggers and wire leader. My name is Al Hulsebosch and I am the caretaker of Neptune's Cove. I have been diving since the spring of `95 (I decided learning to dive was going to be cheaper then playing golf while I was in Hawaii. It was $$$ a round and all I was doing was losing a lot of golf balls.) To date, I have 391 dives. I am currently a PADI certified Master Diver & Dive Master, as well as an IANTD Technical Nitrox Diver & Advanced Deep Air. You may be able to tell by the type of site information I have collected that I am quite addicted to wreck diving. But I try to get wet (figure of speech, as I normally dive in a dry suit) as often as possible. My Club involvement started in summer of `95 and have served as Vice President and then President (never make a beer run while nominations are being taken!). 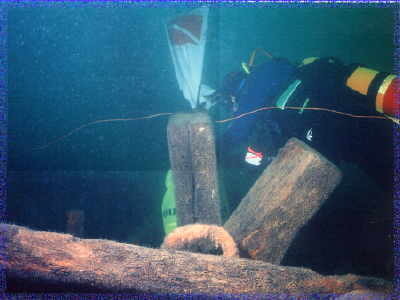 I have assisted in a number Club events, including our Annual Banquet and Treasure Hunt Dive. The Club is where I've met the majority of current dive partners (the ones with the boats that allowed me to get those 391 dives in). Through the club I have gone from an Open Water Diver to a beginning Technical Diver (ice diving and deep wrecks mostly). My other big hobby/vice is computers and telecommunications. I have been playing (I am an old style hacker, someone who loves to dig into the hardware and programming to find out how things work.) with computers since `78 and telecommunication (through the Navy) since `80. My first EMail account was in `85 on the Bitnet (b.I. - before Internet, but later absorb into what is now the Internet). I started in `88 "Telnet"ing, "Gopher"ing, etc. Payed for my first shell account in `90. And used Lynx about 6 months after it came out. Boy, I must be a dinosaur. As you can tell from my site, I still love computers and playing with code (HTML and Java Script are just more programming languages). Fortunately, this hobby has been able to keep the bill collectors at bay.